Fans of villains, heels, bad guys and girls, Drew Pearce has the movie for you with Hotel Artemis, a wholly original sci-fi noir with a killer cast. I know, you'll see plenty of people calling it a ripoff of John Wick's heelish hotel The Continental, but that does a disservice to a film with action, colorful characters, and just enough drama to stand apart on its own. Jodie Foster, in her first screen role sine 2013's Elysium, plays The Nurse, who shuffles around what looks from the outside to be a rundown high-rise building. But inside is where all the fun is, because she serves a very special clientele. Only criminals are allowed inside, and then only those with membership, to what is revealed to be a hospital that patches up their kind away from prying eyes. 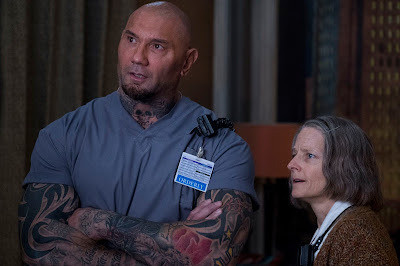 By her side is the massive orderly, Everest (Dave Bautista), and the two share a genuinely sweet and funny rapport, this mountain of a man and this innocent-looking old lady. The Hotel Artemis has been around for 22 years, but it's about to have a very bad day that threatens to be its last. As a riot rages in the streets of Los Angeles in the year 2028, a bank robbery involving Sherman (Sterling K. Brown) and his brother Lev (Brian Tyree Henry) goes sideways, leaving the latter shot and near death. Good thing he's paid up on his Hotel Artemis membership dues! They arrive just as French assassin Nice (Sofia Boutella), an old friend of Sherman's, is checked in but clearly tracking a high-end target. Meanwhile, a mouthy arms dealer (Charlie Day), an injured cop (Jenny Slate) with links to the Nurse's past, and boss level crimelord The Wolf King (Jeff Goldblum) are making for a very crowded and very deadly predicament. See, the bad thing about criminals is they don't often obey the rules, and the Hotel Artemis has very specific rules. Like no killing the other patients. How long do you think that rule holds up? While there a couple of shootouts, one gruesome stabbing, and a hallway fight scene that will remind you of Boutella's nimble turn in Kingsman: The Secret Service, this isn't a kill-a-minute type of flick. It's about watching really terrible people communicate in the only language they know, through deceit and violence. Eventually somebody's got to emerge as the baddest of the bad, and the fun is figuring out exactly who will survive to kill another day. Pearce, a fan-favorite writer best known for penning Iron Man 3, and Mission: Impossible-Rogue Nation, does a good job of weaving together all of the various storyarcs in a way that makes sense. There are still a good share of loose ends, though, and certain characters you'll wish had bigger parts to play. It's criminal that we don't get more Jeff Goldblum, that's all I'm saying, and Bautista is so funny as Everest he almost deserves his own movie. So many of the hearts are black in Hotel Artemis that we can't help but fall in love with Foster as the pragmatic, genuinely-caring Nurse. She's the one holding the place together, giving her dangerous clients guff when they talk back, while at the same time racing from room to room to see to their wounds. Despite the blood stains on the pillows and the peeling paint on the walls she runs a tight ship, and Pearce makes us care how someone like her wound up in a place like this. He's smart to not delve too deep into the sappy aspects of her past, except to use it to inspire more bloodshed. Although they'll rarely get their due it's true that villains are far more interesting than their heroic rivals. Hotel Artemis is a shining example of how much fun a movie about bad people can be, and hopefully Pearce finds a way to keep telling their stories.